This Sunday Afternoon II tapestry shows the work of artist Betsy Brown. 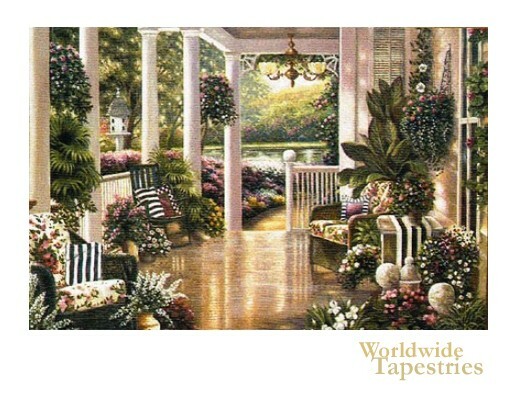 Here we see the sumptuous scene of a country manor patio with greenery and flowers, as well as chairs and cushions with floral and stripe patterns. The corridor leads the eye to the garden and pond beyond. This Sunday Afternoon tapestry is backed with lining and tunnel for easy hanging.